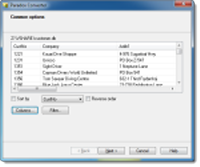 Paradox Converter allows you convert Paradox files (DB files) to DBF, Excel(XLS, XLSX), CSV, SQL (MySQL, SQL Server, Oracle), TXT, XML, RTF, XML and HTML. So, you have more than one Paradox database to convert? Look no further, as Paradox Converter does the job quickly and silently. With the support for multiple databases to process, Paradox Converter is capable of converting dozens or even hundreds of DB files in 100% automatic mode. No questions asked, no harm done, the program intelligently transforms all your databases to the selected format or formats. For more complex tasks more advanced methods are required. Paradox Converter offers command line support for scheduled conversion of databases, complex filters for partial transferring of data to new formats and flexible sorting for custom presentation of data. Here You can subscribe to the Paradox Converter mailing list, where we will provide you with latest information about upgrades and other topics concerning this program .